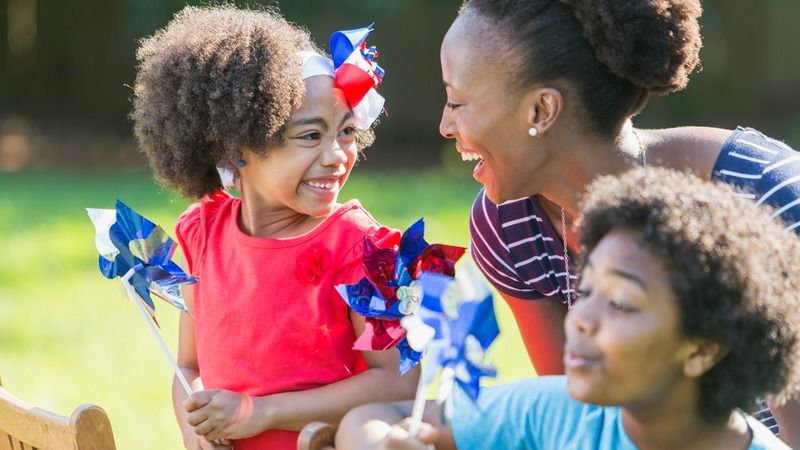 These days, Labor Day is an excuse to gather family and friends together for one last summer barbecue or vacation before it's back to the hustle and bustle of another school year. However, the holiday, which dates back centuries, is about so much more than getting another day off work to sleep in and play (though, those are indeed perks!). At its most basic, the holiday, which falls on the first Monday of September, is a celebration of the millions of workers who keep the United States (and Canada if you're north of the border) running. But the more detailed history paints a picture of how difficult working conditions were during the Industrial Revolution and why, especially now, it's vital to advocate for workers' and union rights. Here, we've laid out an easy way to talk to kids about the important federal holiday. The U.S. established Labor Day as a federal holiday in 1894 following years of social unrest between laborers and employers. While the Industrial Revolution brought many wonderful things to the nation (namely enhanced transportation, innovations like the telephone and more job opportunities), it also created a slew of problems for employees (sometimes children) who worked long, hard hours seven days a week. After years of mistreatment, unions popped up all over the country to advocate for workers' rights, often by helping organize labor strikes and rallies. However, not every union could liberate workers from more tyrannical employers, and this sometimes led to uprisings and violence. Such was the case with the Pullman Strike of 1894. Business Insider reports the strike began after The Pullman Palace Car Company in Chicago, which made luxury rail cars, severely cut the laborers' wages and refused to improve working conditions. Appalled, the American Railroad Union advised for businesses to boycott Pullman's products, which ultimately impacted transportation across the nation. The situation continued to worsen, and ultimately, the federal government sent troops to Chicago to restore order. As you might have guessed, the troops' presence only escalated the violence, and up to 30 people died as a result. Soon after the strike, President Grover Cleveland declared Labor Day as a federal holiday to recognize the many sacrifices and contributions American workers make daily. You can make this history as detailed or simplified as you'd like, depending on the age of your children. Working conditions have greatly improved in the United States since the 19th century, but we still have a long way to go before all workers are treated with the dignity and respect they deserve. Sadly, things are only getting worse for laborers and unions under the current administration. In May of this year, President Donald Trump signed three executive orders that targeted federal labor unions and, therefore, hurt federal employees. Under these orders, Trump has made it more difficult for employees and union reps to file grievances or bargain for workplace changes while also making it easier for federal employers to fire workers. While kids may not be able to fully grasp executive orders or labor unions (honestly, many of us could use a refresher), you can still communicate that workers still face issues today. To make it a positive lesson, you can explain why it's important that kids learn how to advocate for themselves at an early age. Ever have a feeling that no one in your family truly understands what it is you do for 40 hours a week? Use this Labor Day as an excuse to bring your kids into your world by running them through your various responsibilities. Think of this as your turn for show and tell. Let's face it; not every kid is going to want to follow in her parents' footsteps. And that's totally OK! Teach your little ones about the huge variety of career options by reading books about different jobs. You can also schedule kid-friendly visits to the local veterinarian office or fire station. Sometimes, these groups even host special days where kids can come and ask questions. For older kids, you can start talking about which kinds of internships and after-school work or volunteer opportunities interest them most. Bust out the glitter glue and have a little fun with Labor Day-appropriate crafts. Kids can make thank-you cards for people they see on a regular basis (the mailman, the barista at your favorite coffee shop, the garbage truck crew). Or get out some magazines and have kids cut out images to make fun career vision boards. Of course, you should also make a little time to kick back and relax this Labor Day weekend. You deserve it! A version of this article was originally published in August 2012.